The Display Recognition design is subject to change. 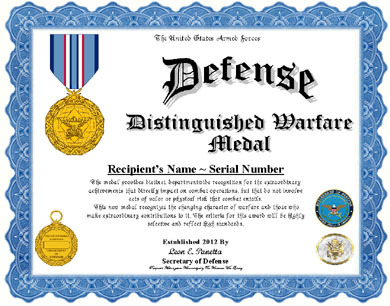 An unaltered photocopy of your DD-214, NG 22 or other military issued document clearly displaying your DOD Distinguished Warfare Medal authorization. 13 Feb, 2013 -- Technological advancements have dramatically changed how the American military conducts and supports warfighters. Unmanned aerial vehicles, unmanned underwater vehicles, missile defense technology and cyber capabilities all affect combat operations while the operators may not be anywhere near the combat zone. The new medal recognizes the contributions of these service members. Defense Secretary Leon E. Panetta has approved a new medal designed to recognize service members directly affecting combat operations who may not even be on the same continent as the action. The medal provides distinct, departmentwide recognition for the extraordinary achievements that directly impact on combat operations, but that do not involve acts of valor or physical risk that combat entails. The member's actions must have resulted in an accomplishment so exceptional and outstanding as to clearly set the individual apart from comrades or from other persons in similar situations. It will be awarded in the name of the secretary of defense to members of the military whose extraordinary achievements directly impacted combat operations, and cannot be used as an end-of-tour award. In the order of precedence, the Distinguished Warfare Medal will be below the Distinguished Flying Cross, and will be limited to achievements that are truly extraordinary., a DOD official said. 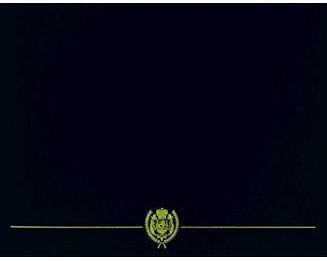 Award criteria will be incorporated into the next revision of DOD Manual 1348.33-V3, Manual of Military Decorations and Awards, Volume 3.